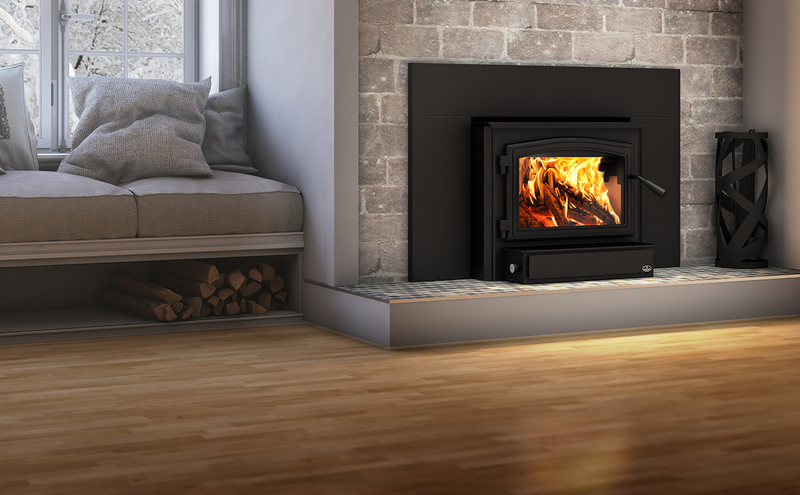 The new standard lowering the fine particulate emission threshold will be conquered by the recent certification of the Osburn 2000 wood burning stove. This revamped version now offers an incredibly low average particulate emissions rate of only 1.54 g/h, a maximum heat output of 75,000 BTU/h and 77% optimum efficiency. This insert still has a 2.4 ft3 combustion chamber and a 144-CFM ultra-quiet variable speed fan that is strategically positioned to redistribute heat throughout the room. Designed to receive an optional faceplate that can cover a masonry hearth up to 32 inches (81 cm) high and 50 inches (127 cm) wide. A steel door overlay is available in black or brushed nickel as well as faceplate trims. Look no further, treat yourself to Osburn's legendary quality! Glass surface – dimensions (Width X Height) 17 1/8" X 10 1/4"
Overall dimension (Height) 23 1/8"
Overall dimension (Width) 28 3/8"
Overall dimension (Depth) 26 3/8"